CMPD is participating in a high-visibility national enforcement campaign, Drive Sober or Get Pulled Over. 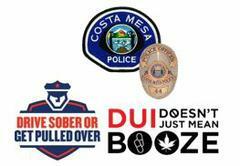 COSTA MESA, Calif. – As we enter the final stretch of summer, spending time at the pool or barbequing with friends and family, the Costa Mesa Police Department (CMPD) will join law enforcement throughout the state to drive home the importance of celebrating responsibly by not driving, or riding a motorcycle, impaired. Starting tomorrow, from Aug. 17, 2018, through Sept. 3, 2018, CMPD is participating in a high-visibility national enforcement campaign, Drive Sober or Get Pulled Over. During this period, Police and Sheriff’s Departments statewide, along with the California Highway Patrol, will increase the number of officers on the road to stop suspected drunk or drug impaired drivers and motorcyclists. If you are caught driving or riding impaired, you will be pulled over and arrested. CMPD will have a special emphasis during this 18-day mobilization to enforce all traffic violations by deploying DUI Saturation Patrols. The enforcement campaign runs through the Labor Day holiday weekend, which is one of the deadliest times of year in terms of alcohol-involved traffic deaths. Sadly, one-third of all traffic deaths involve drunk drivers. According to the National Highway Traffic Safety Administration (NHTSA), 10,497 people were killed in alcohol-involved crashes, or one person every 50 minutes. CMPD will show zero tolerance for impaired driving or riding and joins efforts by the California Office of Traffic Safety (OTS) to educate drivers that “DUI Doesn’t Just Mean Booze.” If you take prescription drugs, particularly those with a driving or operating machinery warning label, you may be impaired enough to get a DUI. Marijuana can also be impairing and result in a DUI, especially in combination with alcohol or other drugs. From 2005 to 2015, the percentage of drivers in fatal crashes with an impairing drug other than alcohol in their system has risen from 26.2 percent to 42.6 percent. As far back as 2012, a roadside survey in California showed more drivers tested positive for drugs that may impair driving (14 percent) than did for alcohol (7.3 percent). During this national enforcement campaign, there will also be increased state and national messages about the dangers of riding impaired, which combined with enforcement, aims to drastically reduce drunk or drug impaired riding on our nation’s roadways. Motorcycles require specific training and skill. When a rider adds alcohol, marijuana or impairing prescription medication to the mix, it is not only illegal, but increases the risky nature of riding a motorcycle. There are so many options out there to get home safely. There is no excuse for getting behind the wheel when you are impaired. •	Always designate a sober driver. •	Use public transportation or a ride sharing service to get home. •	Have a friend or family member who is about to drive buzzed or impaired? Take the keys away and make arrangements to get them home safely. •	Report drunk drivers - call 911. Funding for this DUI operation is provided to CMPD by a grant from the OTS, through the NHTSA.